This Thanksgiving Day, Atlanta Track Club is thankful for the sponsors and partners that help make the AJC Peachtree Road Race possible. It is thanks to the generosity of these sponsors that registration costs have remained lower than the average road race, the post-race snacks and giveaways have been best-in-class and the Peachtree has gone from a small Atlanta tradition to a worldwide party. This week, we take a look at the Peachtree’s proud partners and their storied histories with the world’s largest and best 10K. Atlanta’s newspaper has been the title partner of the AJC Peachtree Road Race since 1976 when publisher and avid runner Jim Kennedy joined forces with Atlanta Track Club. Since then, the AJC has been the place runners turn to for news and human interest stories about the race and to submit their registrations. Until the mid-2000s, entry forms had to be cut out of the newspaper, filled out and mailed in. Now, runners can register by going to the AJC’s website. 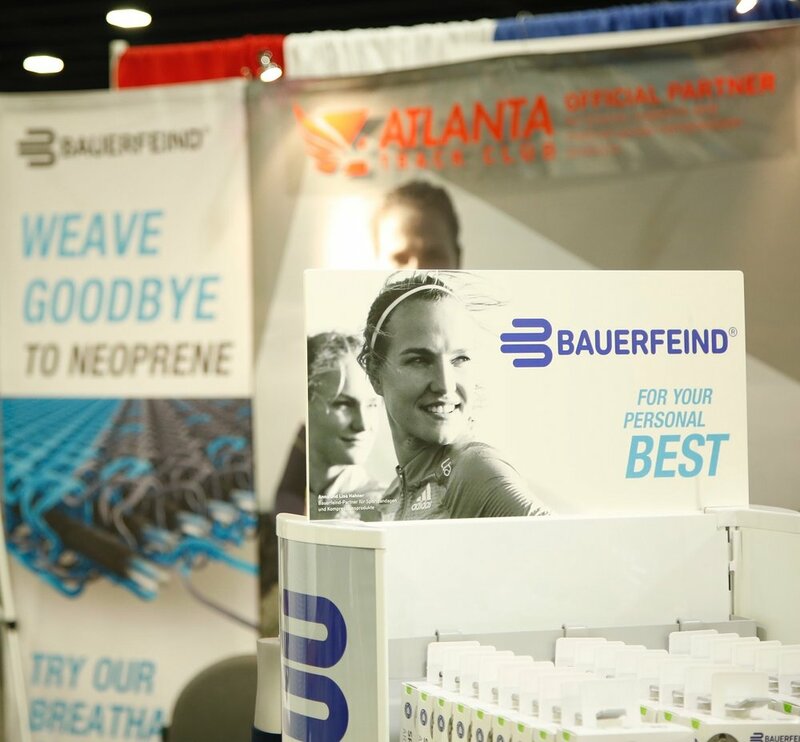 One of the newest partners at Peachtree, the world’s leading manufacturer of braces and supports calls Atlanta ‘home’ in the United States. Blue Cross Blue Shield of Georgia is the title sponsor of the Peachtree’s younger sibling, the Peachtree Junior. It also funds the popular family meeting area and the much-needed shade tents in the meadow at Piedmont Park. Coca Cola first appeared on the finisher’s shirt at the 1981 Peachtree. But this photo of a volunteer from the 1979 race shows that Atlanta’s most recognizable brand has had a Peachtree presence since the race’s first decade. Runners need fuel. Clif has been providing race day nutrition since 2015. Every finisher gets a Clif bar when they cross the line to replenish some of the calories burned on the race course. Delta first appeared on the coveted finishers’ shirt in 2004, but it too has been associated with the AJC Peachtree Road Race since its inception. A conveniently placed Delta billboard towers above the runners assembled on the start line of the 1972 Peachtree. In fact, the partnership dates back so long that neither Atlanta Track Club nor Delta have records of when it began. Since the early 2000s, the Delta Runway to the World contest has sent one lucky Peachtree participant to run a race at a far-off location. Last year, the winner was awarded a trip to Paris to run the Paris Marathon. The electric company powers the Peachtree in more ways than one. In 2019, the utility will provide charging stations for your phone in the finish area so you can take all the selfies you’d like and not worry about draining your battery! The home improvement chain has been improving the race-day operations of the 3,500 Peachtree volunteers since the turn of the century. Each volunteer gets a Home Depot apron to wear on race day. 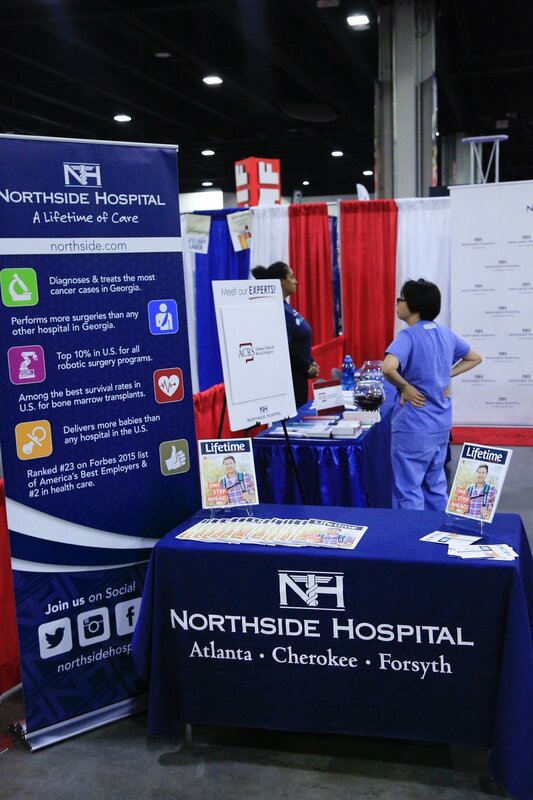 If you are lucky, you may spot the company’s famous tools at the Peachtree Health and Fitness Expo. The Official Vehicles of the AJC Peachtree Road Race turn heads as they lead the field of 60,000 to Piedmont Park. Mercedes-Benz of Buckhead provides the official Peachtree pace car each year. The official footwear and apparel partner of Atlanta Track Club and the AJC Peachtree Road Race, you can find Mizuno’s iconic run bird on every piece of Peachtree gear you buy at the Peachtree Health and Fitness Expo. Since 2016, Atlanta-based Mizuno USA has created a limited-edition commemorative Peachtree shoe. Wait until you see the 2019 edition! Training for a road race, especially in the heat of Atlanta, can be tough on your body. Since 2010, Northside Hospital has provided with advice that makes sure runners are healthy and ready when they cross the start and finish lines. 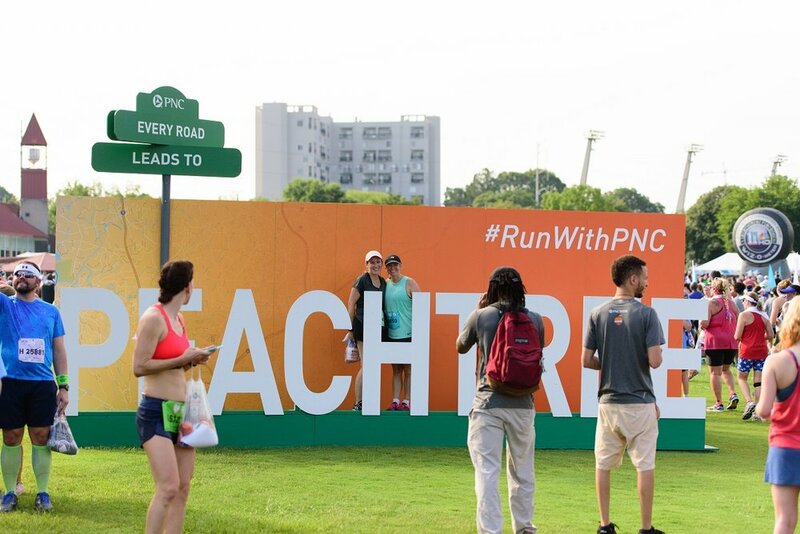 You can’t miss PNC at the Peachtree Health and Fitness Expo or the in the meadow at Piedmont Park. If they are not giving away great prizes, they are providing photo backdrops that make for a memorable Instagram post. UPS has been delivering smiles to the Peachtree since 1997 especially for the more than 2,000 UPS employees that run the race each year. The race is so popular at UPS headquarters that the logistics company even makes its own commemorative shirt each year. There’s nothing better than a cold beer after a hot run. Yuengling, America’s oldest brewery, has been serving up free beer in the Atlanta Track Club member party at Park Tavern since 2017. Atlanta’s top-rated sports radio station is the home of the Braves and the Peachtree – two Atlanta summer traditions. Not only is 680 the station for the latest AJC Peachtree Road Race news, they also broadcast live from the Atlanta Track Club member party at Park Tavern every year. The involvement of Atlanta’s pro sports teams in the AJC Peachtree Road Race over the years.